Bread: A Memoir of Hunger, with its yeast-bubble cover art, screams anorexia memoir from all surfaces. In fact, when I found myself carrying it around one evening with a to-go slice of chocolate cake in my other hand, I realized I might have looked a bit troubled, or, oppositely, totally recovered and beyond reproach. This teeter-tot line between disorder and recovery, or malady and remission, is the liminal space Knopp inhabits best in her book. Bread is much more a full life memoir than an eating disorder memoir. Writing comes up often, and spirituality is everywhere. With her title “a memoir of hunger,” Knopp doesn’t mean just the hunger I feel now because it’s late in the day and I ate lunch early. She means all of our human hungers: for justice, for love, for meaning. The first chapters make an inventory of longings, and bit by bit, Knopp slowly shows us how she’s come to satiate herself. I haven’t experienced the “malady” of disordered eating as deeply and consistently as Knopp has. However, early in the book, when she describes the quiet “click and shift” that happened in her brain the first time she began to enjoy and succeed at restricting food, I remembered the summer after my junior year of high school when I dropped 10 pounds in a month. That summer, I brought Ziploc bags of red things to the beach with me, and a towering Nalgene of water. The red things in separate bags were strawberry Twizzlers and slices of sweet red pepper. I relished the count: a single Twizzler contains 5 calories, a single slice of sweet pepper far less. That summer, too, I ran 2.5 miles every evening and lugged a nearly 50-pound stand-up paddle board to the shore every morning, giddily awaiting the next day’s upper body ache. Though Knopp draws lots of fascinating points and parallels from her lit-review, she occasionally stacks the pile of articles perilously high. In “Chapter Six: Hardwired,” nine pages of recounted university studies make the chapter begin to lose its punch. Knopp’s focus on the biological causes and symptoms of anorexia and bulimia also felt to me like a negation of the absurd social contexts that birthed these diseases in the first place. Why not point more rage toward the patriarchy and media machines? Out of all, bread the food is Knopp’s favorite high-tension metaphor, and she does an exquisite job of excavating its historical meanings for us along the way. In “Chapter Two: White Bread,” we enter her Iowan childhood just in time for the rise of Wonder Bread, and other ingestible “industrial marvels.” Using a cue taken from her writing heroine Annie Dillard, Knopp succeeds at transforming bread from a plain fact to a “symbolic fact,” one that stands for all the “tantalizing paradoxes” of her life. Sierra Dickey writes, walks, and organizes from Brattleboro, Vermont. Find her on Twitter @DierraSickey, or read her work in or read her work in Coming of Age at the End of Nature from Trinity University Press. 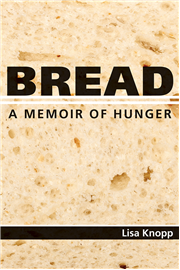 @DierraSickey (with an interesting switch of the S&D), you have given a good review of @lisa_knopp ‘s recently @umissouripress published memoir, Bread: A Memoir of Hunger. As a writer yourself (with your essay appearing in the anthology Coming of Age at the End of Nature published by @tupress) you tell of Knopp’s account of living with anorexia and bulimia. And, as she writes, “In ‘Chapter Two: White Bread,’ we enter her Iowan childhood just in time for the rise of Wonder Bread, and other ingestible ‘industrial marvels. '” I, too, grew up in Iowa. I recall a Wonder Bread truck driver stopping at the edge of the school playground and giving kids Wonder Bread balloons and pencils in exchange for our saved Wonder Bread loaf bags. SIERRA D – my pleasure! What a captivating review, I want to read it!